The Eurocom Panther notebook is the first notebook on earth with a 12 core, 24 thread Intel Xeon E5-2600 V2 processor up to E5-2697 v2. The EUROCOM Panther is the first workstation and server class notebook with Intel Xeon E5-2600 v2 processors, 6 Terabytes of storage, RAID 0/1/5/10 and a 1 hour battery life. 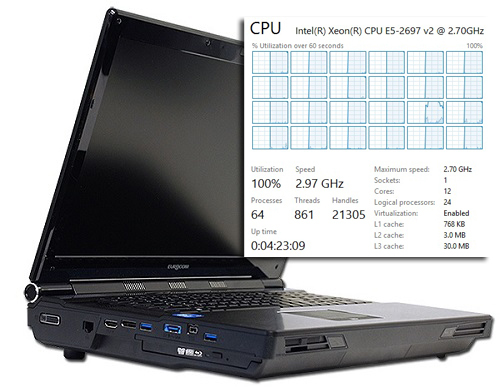 Eurocom is supporting the entire family of E5-2600 v2 Xeon processors ranging up to 12-cores/24-treads including E5-2697 v2, E5-2687w v2, E5-2697 v2, E5-2695 v2, E5-2690 v2, E5-2680 v2, E5-2670 v2, E5-2650 v2 and E5-2620 v2. “For its continuous innovation and creation of new computing form factors such as the Mobile Serve, Eurocom received the 2013 Intel Form Factor Solution Innovation Award. Since then Eurocom has continued to push the boundaries of innovation with a major technological breakthrough of incorporating a 12 core, 24 thread processor into a notebook form factor for massive performance on the go.” Mark Bialic, Eurocom President. Eurocom, the world’s leading develop of highly personalized, high performance notebooks PCs and energy efficient All in One Desktops, introduces the EUROCOM Panther Mobile Workstation, Mobile Server and 3D Workstation powered by Intel’s new line of Intel Xeon E5-2600 V2 processors and Intel Core i7 LGA 2011 processors. The EUROCOM Panther supports a variety of operating systems on the market including Windows 8, Windows 7, Microsoft Server 2012, RedHat Enterprise Linux Server Edition 6.4, VMware vSphere Hypervisor 5.5. The EUROCOM Panther, which measures 16.76x11.44x2.31-2.48inch and weighs 12 lbs, supplies tremendous SATA 6 Gb/s storage. Customers can choose between RAID 0,1,5 or 10 for the ultimate transfer rates and application load times or redundancy. Full Upgrade ability and Full Customization of Eurocom mobile workstations and servers are built on a customized basis so that users can select the individual configurations they require. Eurocom systems offer stylish all-in-one design, superb performance, upgrade ability and latest computing technology. Based on the chosen configuration the Eurocom Panther can be built to be the ultimate Mobile Workstation, 3D Mobile Workstation or Mobile Server. The EUROCOM Panther was awarded the 2013 Intel Form Factor Solution Innovation Award for delivering the most innovative mobile solution based on Intel Technology to meet our customers’ demands for mobility. Eurocom corporation successfully conquered the challenge of, packing an appropriate amount of processing capability, storage capacity, memory, and back-up battery into a sub-12 pound form factor, by outfitting a desktop replacement chassis with the highest quality components, including the Intel® Xeon® processor E5 series and Intel® S3700 solid state drives – chosen for their ability to support both workstation and server-class operations. Known as the EUROCOM Panther, this new super computer has the performance capabilities of a datacenter server in a portable form factor, complete with workstation tools such as keyboard and monitor. EUROCOM Panther 4.0 mobile workstations are designed specifically for high-end professional and graphics users demanding maximum performance and power when running professional applications such as CAD/CAM/CAE, 3D animation, 3D simulation, engineering, financial simulations, math, forensic, 3D imaging, mapping and charting, satellite image processing, GIS, or medical software, or graphics work. The EUROCOM Panther supports a full line of professional graphics from NVIDIA including Quadro K5000M, K5100M, K4000M, K3000M and K2000M to give customers four distinct levels of professional grade performance. NVIDIA Quadro GPUs are designed and built to provide leading performance, reliability, compatibility and stability with applications like Adobe Creative Suite 5.5, Autodesk 3DS Max, Autodesk Autocad 2011, Autodesk Inventor 2012, Avid Media Composer, Dassault Catia, Dassault Solidworks, Siemens X, ANSYS, MATLAB, Dassault Simulia, among many others. NVIDIA Quadro K5000M is ideal for professional applications such as video editing, color correction, compositing, design visualization and GPU-accelerated ray-traced 3D rendering. Powering the three dimensional displays of the EUROCOM Panther 5D are an optional NVIDIA GeForce GTX 780M in single or dual operation or NVIDIA Quadro K5100M graphics. Professional 3D capability is offered by combining 3D Vision glasses, a built in emitter, a 120hz panel and 3D capable software.